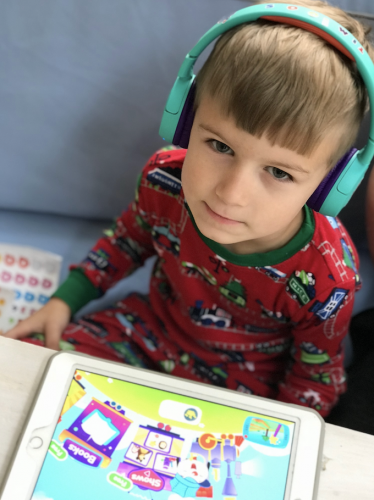 Home / Family / Holiday Gift Guide For Kids! Holidays are definitely the most fun when there are kids involved! I have an entirely new Christmas spirit and cheer ever since having my boys. Watching them all wake up on Christmas morning and run excitedly to open their presents, is the best! I know holidays are mainly about being with family; but when you can also find some great gifts, it’s all around awesome. JBL headphones–We travel back and forth to Idaho on five hour flights to see my family. We also drive two hours to and from the beach on many weekends. I’ve finally given in to the fact that an IPad is good entertainment for all of the boys when we have long trips. Each kid watches their own favorite show and when we are on a flight we need to be mindful of the other passengers. The JBL wireless headphones have been a lifesaver for us! The boys love having them on, especially since they come with stickers so they can personalize theirs. Timothy is so proud of his. 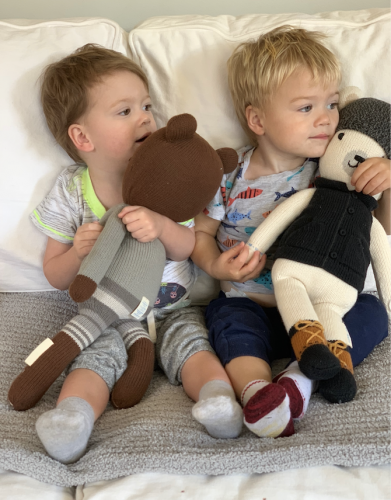 Cuddle +Kind: These hand knit dolls are so fluffy and comfy for the twins and the best part is that the founders wanted to make the dolls to help feed children. So for every cuddle+kind doll sold, we give 10 meals to children in need. Yoga Dice—Any game that teaches mindfulness and yoga, is definitely a gift worth giving. Think Fun’s yoga dice is a great wrapped present or one to put in a stocking. The game includes: 6 six-sided Yoga Pose Dice, 6 Pose Tokens, 1 six-sided Breath Die, 1 Focus Token, Yoga Mat Game Track, Game-Go Bag and an Instruction Booklet (with Yoga Pose Descriptions). We take ours with us everywhere. I love how the entire family can play this game and it challenges Timothy physically, mentally and spiritually. 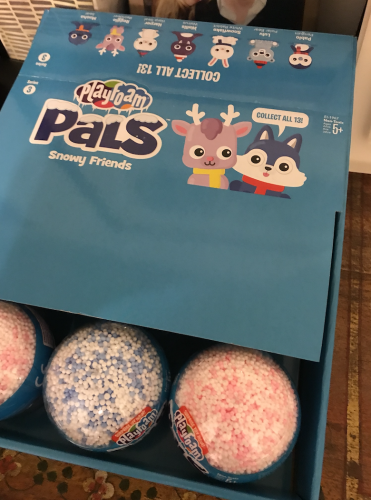 Snowy Friends—I love Educational Insights and these little snowy friends are so much fun for Timothy and his friends. We ordered a dozen and he gave one to each of his school friends for the holidays. The kids love collecting the little figurines inside of the play foam. The foam itself is fun to sculpt and mold in to shapes as well. Sneaky Squirrels—Board games are a huge hit in our household and one of our favorites as of late is Sneaky Snacky Squirrel. The game includes four different colors of acorns, a spinner and four tree stumps. The goal is to collect one of each color acorn to win. You can sometimes spin the sneaky squirrel and steal an acorn from another player. We also love the Sneaky Snacky Squirrel flap book from Educational Insights. Etch A Sketch—Etch a Sketch is a classic game that never goes out of style. My boys love to draw and doodle all day long on their etch a sketch. I personally find myself getting drawn in as well! I love a toy that inspires creativity and imagination. The game is great to bring in the car, on long flights and even out to restaurants. 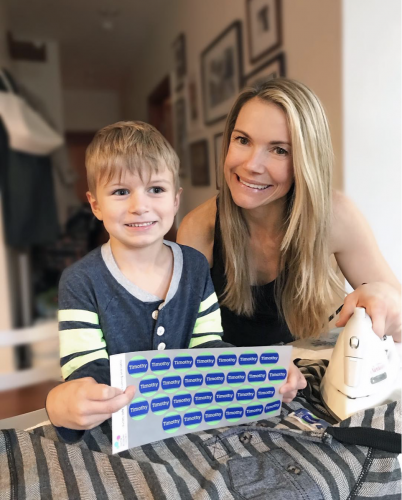 Name Bubbles—Timothy started kindergarten this year and we needed to label all of his school supplies and clothing items. We ordered some from Name Bubbles and he loves them! He has rainbow name labels and he puts them on everything. 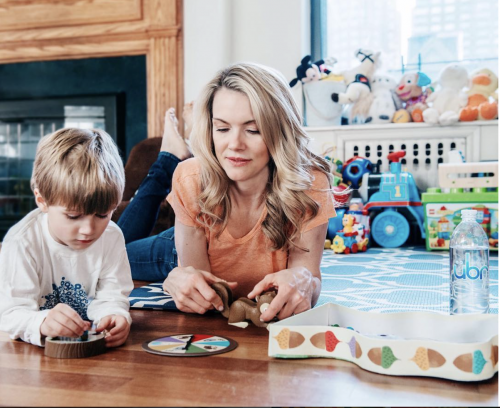 Name Bubbles are a super fun out of the box gift idea that kids, and moms, truly love. 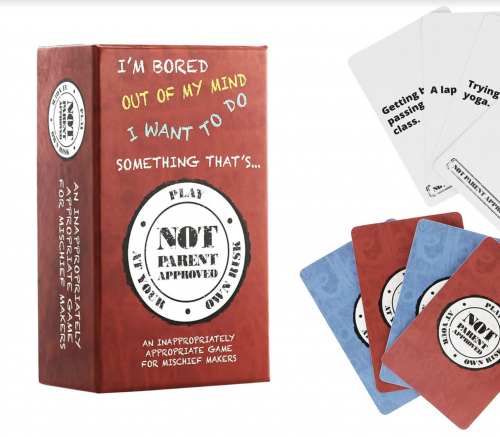 Not Parent Approved–This card game was invented by two moms desperate to get their tween and teen kids to look up from their screens and play a game, interact, and speak out loud! I am getting this for my 9 and 11 year old nephews and think it is the perfect holiday gift for older kids and teens. The 455 cards (105 questions and 350 answers) involve cultural references from Taylor Swift to wedgies. Best of all, it’s offline requiring no plugs, cords, earbuds or charging. Kids must look at each other and interact in conversation. Imagine that! 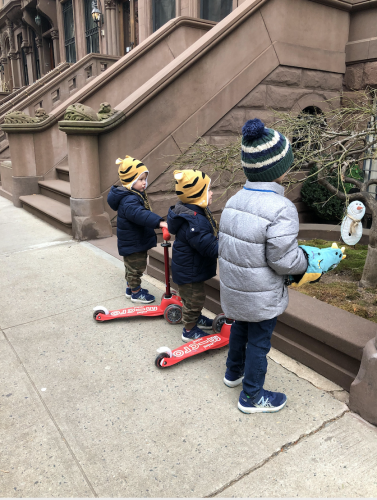 Veyo Mittyz–Thumbless gloves are a lifesaver for me and my boys. We have cold NY winters and we all love to go home to Idaho and ski with my family. These gloves are brilliantly designed and SO adorable. Timothy has the dragon pair and he gets compliments every time he wears them. I ordered some tiger paw mits for the twins since we have the hardest time putting their hands in traditional mittens. I seriously love these! Bendigirl DVD—I am a little biased since I created this yoga DVD for kids; but I think it’s awesome! 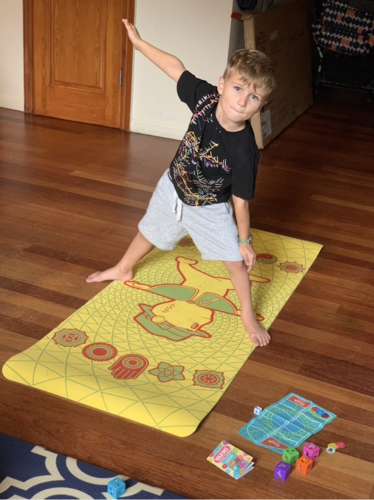 Kids love to move and learn yoga poses and the DVD is so much fun. Moms can get a great workout too when they do this with their children. 5 Life Changing Holiday Gifts for Tweens!